The kick-off for the 2018 edition of the course is nearly there. To get everybody in the mood properly, some interesting articles have been uploaded to the E-readers page. Also, don’t forget to look at the finalized course programme for the week in Dubrovnik. The official programme will start on Monday april 16. The academic programme of the course has officially started in the Inter University Centre in Dubrovnik: 33 participants, 17 resource persons with 16 different nationalities. Today, presentations from John Clarke, John Barry and Cedric Ryngaert. The applications for the 2016-course are open! In joint cooperation with the Inter University Centre Dubrovnik in Croatia, different universities from various EU candidate member states organise the 10th edition of this bi-annual international honours course. The 2016-course will take place from 18-22 April in Dubrovnik and its central theme is Building and Promoting Human Security. The course is selective and is primarily open to masters- and PhD-students. Upon special request, outstanding students at the end of their bachelors could apply as well. The selection is made by the course directors and/or the participating institutes. If you want to apply for the 2016-course, please contact course assistant Raphaël Lepot (raphaellepot@gmail.com) to receive the required information and necessary application documents by e-mail. The preparations for the 10th session of the course on inclusion and exclusion in contemporary European societies have started.Today we uploaded the background information of the 2016-course! Are you curious to know what Challenges of Europe are we going to tackle this edition? Please visit the pages on Edition 10: the 2016-Course to read what the broad questions addressed are during this 10th edition! Also the list of resource persons (course directors & international staff) has just been submitted on this website. Already eager who is going to lecture you? We are still working on the reading materials and the academic programme. The website will be updated soon! The website is updated with the participant papers of this years edition on the Quest for Citizenship: look here. The fourth release of the Dubrovnik Daily 2014 is available on our website! Download it now! The third release of the Dubrovnik Daily 2014 is available on our website! Download it now! The second release of the Dubrovnik Daily 2014 is available. Download the PDF and read the Wednesday morning edition about the second day of the academic programme on your I-pad! The first print of the newspaper ‘Dubrovnik Daily’ has been released! Please visit the 2014-course to read the Tuesday morning edition about the first day of the academic programme! Today the academic programme of the 2014-course has started. From all the today-lecturers, the slides are uploaded on this website. Visit the programme page and click on the lecture to find the slides of the presentation. Tomorrow in the morning we will have lectures from Ladislav Rabusic and Brigitte Unger, in the afternoon the first group of participants will give their presentations! This weekend, almost all participants and resource-persons have gathered in Dubrovnik. We expect the last participants tonight and tomorrow early morning, because tomorrow the academic programme of the course starts! After an introduction from Wieger Bakker, we will have lecturers from Frans van Waarden, John Clarke and Ige Dekker. Do you want to know more about the programme? Please check the pages of the 2014-session. And for who is already interested in lecture of John Clarke: we have just uploaded an recent article from him about ‘Disputing citizenship in an age of austerity‘ in the E-reader. The website has been updated again: A new version of the provisional (academic) programme is now available! Click here to open the PDF-version of the programme. We wish you all a safe and pleasant travel to Dubrovnik this weekend. We are looking forward to meeting with all of you very soon! If you have any urgent questions before your departure, we will try to answer them before our departure tomorrow early in the morning. The website has been updated again: A new version of the provisional (academic) programme is now available! Click here to open the PDF-version of the programme. The website has been updated again: The provisional (academic) programme is now available! Click here to open the PDF-version of the programme. Some presentations (both plenary and in workshops) may be scheduled on a different time or date, but in general this version of the programme gives you a good insight in the different components and the structure of the programme. In the case of any changes we will update this website again. We are already looking forward to meeting with you next week! The website has been updated again: new recommended readings regarding ‘citizenship theory’ are uploaded in the E-reader. As said before: There is enough time for study during our stay, but it is wise that you read as much as possible before take off. Print the articles you want to read in Dubrovnik. Enjoy reading! Furthermore, we are about to finish the academic program of the course. We will update the website as soon as possible when the program is available. Concerning all the outlines you have sent us: we will send the feedback to you individually by the end of this week! For all participants and resource persons flying with Croatia Airlines to come to Dubrovnik. Good luck with packing! – International flights: 1 piece, max. weight 23 kg, maximum sum of dimensions of each piece is 158 cm. – Domestic flights: 1 piece, max. weight 15 kg, maximum sum of dimensions of each piece is 158 cm. The website has been updated again: new recommended readings by Viktor Koska are uploaded in the E-reader. All the contributions in the E-reader are linked with the overall theme of the course and/or are papers written by the resource persons. Some of those background papers also are linked with the theme, but do not directly reflect the presentation during the course. There is enough time for study during our stay, but it is wise that you read as much as possible before take off. Print the articles you want to read in Dubrovnik. Enjoy reading! The website has been updated with: all the names and nationalities of the participants, new recommended readings in the E-reader and a new page with all the instructions you have received so far. The coming days and weeks before the start of the course some more information will be added to the website. And for your relatives and friends: during your stay in Dubrovnik we will post daily new information about the course on this website, so they could follow you and your achievements! Today is the deadline for the outlines for your participant-presentations. We are more than happy to receive all your outlines by e-mail (r.p.m.lepot@uu.nl). Thank you! The applications for the 2014-course are open! In joint cooperation with the Inter University Centre Dubrovnik in Croatia, different universities from various EU candidate member states organise the 9th edition of this bi-annual international honours course. The 2014-course will take place from 7-11 April in Dubrovnik and its central issue is ‘the Quest for Citizenship’. The course is selective and is primarily open to masters- and PhD-students. The selection is made by the course directors and/or the participating institutes. If you want to apply for the 2014-course, please contact course assistant Raphaël Lepot (r.p.m.lepot@uu.nl) to receive the required information and necessary application documents by e-mail. New information has been submitted to this website. Today we uploaded information about the content of the 2014-course! Are you curious to know what is behind the Quest for Citizenship? What Challenges of Europe are we going to tackle? Please visit ‘the 2014-course, background‘ to read what the broad questions addressed are during this 9th edition! The preparations for the 9th session of the course on inclusion and exclusion in contemporary European societies have started. The list of resource persons (course directors & international staff) has just been submitted on this website. Already eager who is going to lecture you? Please check ‘the 2014 course, resource persons‘ We are now working on the course description, background information, reading material and application forms. The website will be updated soon! A great friend and one of the founding fathers of our courses in Dubrovnik passed away. In loving memory of Bart van Steenbergen. His energy, creativity and spirit as a committed teacher we all will miss. Generations of students all around Europe, and beyond, he inspired for more than 40 years. He celebrated the international courses at the IUC and was already looking forward to the next one in 2014. The ‘singing professor’ with his longing to be a 17th century European, will be remembered. The artist he was will stay with us. During our next course in the spring of 2014 we will miss him and we will continue his work and ambition during the Challenges of Europe course. Today, we published the first series of the participant papers that are written following the intensive part of the course in April of this year. Participants wrote these papers based on the presentations, lectures and debates during the week in Dubrovnik (Croatia). You will find the papers on this website, by clicking the 2012-course, participant papers. Today, the hard copy report of the 2012-course is presented to our honourable professor Bart van Steenbergen. We would like to thank all the participants for their contributions to this report and especially the participants that helped editing! A hard copy of this report is sent to all participants and resource persons of the 2012-course. Curious and cannot wait to see the result? Please click here to see the PDF-version the report. On the photo page you can find now series of photo’s made by Wieger Bakker, Frans van Waarden, Brigitte Unger and Raphaël Lepot. The hard copy report of the course will be presented next Thursday June 28. As soon as possible also all participants and resource persons will receive a copy by mail. The first series of papers written by participants will be published on the site around the first of July. 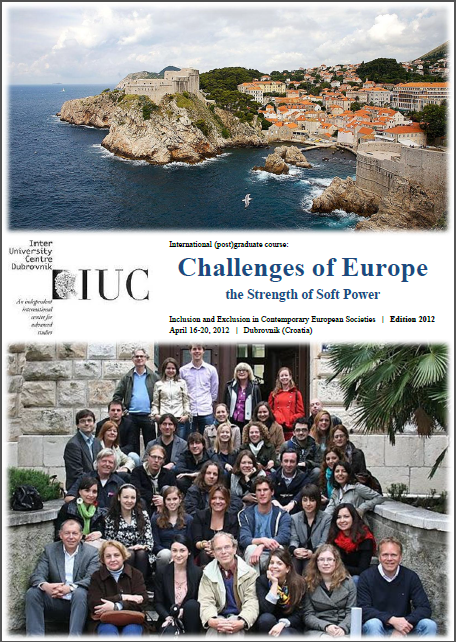 The first photos of the Dubrovnik 2012 course are available on this website. With many thanks to Wieger Bakker! More photos of the course will be uploaded later this week. Besides that, all participants will receive an invitation for a group-page on facebook. This gives us the possibility to share photos together! The the international (post) graduate course ‘Challenges of Europe: the Strength of Soft Power’ is a big success! We already arrived on the third day of the course. We had several inspiring lectures from Frans van Waarden, Viktor Koska, Martin Kreidl, Brigitte Unger and Godfried Engbersen. Interested in their story? Please note the slides of their lectures are published on this website (visit the page: ‘the 2012 course, programme‘). But of course, there is more than lectures and the official programme. Do you want to know more about our activities: each day, our informal newspaper – the Dubrovnik Daily – is published on this website (visit the page: ‘the 2012 course, Dubrovnik Daily‘). Besides that, this evening, some photo’s will be published on this website to complete your impression on the course! This morning, the international (post) graduate course ‘Challenges of Europe: the Strength of Soft Power’ officially started at the Inter University Center (IUC) Dubrovnik (Croatia). All participants and resource persons started by presenting themselves to the others. After the introduction by the course directors, the first lecture of the course will be held by Frans van Waarden (Utrecht University, the Netherlands). The programme and the list of participants are updated again! The actual version of the programme is published under ‘the 2012 course, programme‘. We are looking forward to meeting you all in Dubrovnik and wish you all a very good trip to Croatia! We already have some more information about the additional programme of the course. On Sunday the 15th of April at 14:00 o’clock – for many of the participants and resource persons their first day in Dubrovnik – a guided tour through the old centre of the city of Dubrovnik will be organised! This special tour will be under guidance of our Dubrovnik-expert, the honourable Professor dr. Bart van Steenbergen. We will gather at the large fountain, situated immediately after entering the old city (a 20-minute walk from our Hotel Lero). We are looking forward to meet with you then! Today, course director Wieger Bakker send you the comments on your proposals for the presentation in Dubrovnik. We hope this comments might be helpful in your thinking and preparation for your presentation, that will be held during the course next week! The website is updated with information about the (provisional) academic programme of the course. Please see ‘the 2012 course, programme‘ to gain insight into the different sub-themes and lectures of the course. Already excited and can’t wait to start? More information about the course theme, and papers of several resource persons, are added to this website as well! The (provisional) list of participants is added to this website. Please note ‘the 2012 course, participants‘ for the names of the participants. For now, we have 27 participants with 15 different nationalities that will join the course in April of this year. The course-directors are looking forward to meet you all in Dubrovnik within a month! The first meeting with the participants of the Dubrovnik Course 2012 that stay in the Netherlands will be held on Thursday the 29th of March at the Utrecht School of Governance, Bijlhouwerstraat 6 (map). The introduction to the course starts at 18.00 hours and ends at 21.00. During the evening we have the opportunity to get acquainted and the participants will be informed more in detail on the background, topic, working methods, assignments and organization of the course. We are looking forward to meeting you all at Thursday the 29th of March, 2012! Almost all participants are known now and it is time to start preparing seriously for the course. As you know, all participants are expected to give a presentation during the course in advance on research related to the central theme of the course that afterwards will be the basis for a paper. The specific guidelines for the presentation, the paper and some information on the other smaller assignments you can find on this website. See ‘the 2012 course’ and click on ‘assignments and instructions’. For now it is important to read these detailed guidelines on the presentation as soon as possible and to send (before March 19, 2012) as described a title and short outline of your presentation to Raphaël Lepot (student assistant to the course). You will get feedback on your proposals from one of the course directors as soon as possible by e-mail. The proposals have to be related to the central theme of the course, but you can for instance choose (or combine) different angles to approach the central theme (please take a careful look at the course description) of the course, based on your own research from the last years or your own personal interests. At the moment, you can apply for the 2012 edition of the international course ‘Challenges of Europe: the Strength of Soft Power’! Following the course can be inspiring especially for students with an interest in questions on inclusion and exclusion in European societies. It provides, more than formal conferences an opportunity to broaden your perspective and to get in touch with people, views and experiences from different countries. Are you interested in following this course? Please contact Raphaël Lepot (course assistant, r.p.m.lepot@uu.nl) for further information about the application procedure. The preparations for the next edition of the international course: ‘Challenges in Europe. The Strength of Soft Power.‘ from 16 – 20 April 2012 have started. More information about the subject and the program of the 8th edition of this project will be posted within a few weeks. Exclusively for Dubrovnik graduates: The Professional Parallel! Are you a Dubrovnik graduate? In that case you might be interested in our initiative to set up a network of Dubrovnik graduates. The aim of the network is, first of all, to keep in touch and share working experiences. Besides that, we want to organize activities to relive the Dubrovnik experience and keep up to date with the latest academic knowledge. At this moment, we are trying to get everyone together and see what everybody has been up to. Therefore we invite to join our group on LinkedIn. You’ll find the group if you search for ‘Inclusion and Exclusion Dubrovnik’ on LinkedIn. We are planning to organize the first Professional Parallel event from 14 – 17 April 2011. If you join our group on LinkedIn you’ll receive more information about the first event in January 2011. Click this link to enter the LinkedIn group. Douwe van Houten, professor in disability studies at the University for Humanistics in Utrecht, The Netherlands, passed away on Monday June 21st. Douwe was an old timer in terms of the IUC-courses he participated in; at least 10 or 12 since the mid eighties. For him, this course in Dubrovnik was special. He valued highly the opportunity to work with -and see at work- a divers group of young and devoted students as well as colleagues, on issues concerning inclusion and exclusion. Throughout his professional life, Douwe was a known proponent of diversity and someone who himself devoted most his time challenging government, public institutions and professionals over the exclusion of people who where unrightfully looked at as different. Douwe will be sadly missed by all who knew him. I will long remember him as a tireless fighter for social justice, at home with the underdog and always comitted to combining progressive theory and practice. We will find an appropriate way to honour his memory at our next course in Dubrovnik which he loved so much.